SEPARATING FACT FROM FICTION, the men from the boys, the contenders from the pretenders. The 162-game Major League season is really good at sifting and culling, parsing the real and the fake as any team can ride a hot streak and look for a time like a force to be reckoned with. "Bring the kiddies, bring the wife. Guaranteed to have the time of your life..."
Since the advent of wild cards in 1995, a mediocre team can sometimes sneak into the post-season party and -- though unworthy -- wreak havoc. But back in 1982, the only way to prolong the campaign was to outlast division rivals, making the regular season a proving ground, a cruel crucible where hopes and dreams melt away in bitter disappointment. And so it was on Memorial Day of that year that the New York Mets, occupying second place in the National League East under new manager George Bamberger, met the NL West Division-leading Atlanta Braves led by former Mets skipper Joe Torre. Both teams finished poorly during the strike-torn 1981 season. The Mets landed in composite fifth place in the six-team NL East, at 41-62, prompting Torre's ouster. Atlanta too finished fifth, still competing however illogically in the NL West. Their 50-56 overall record led to Bobby Cox's firing by Braves owner Ted Turner, who then hired Torre. Now the Braves would meet the Mets for the first time since their mutual shakeups. The 26-21 Mets sent Charlie Puleo to the mound. Bob Walk started for the 27-19 Braves, who began Torre's tenure by going 13-0. With a John Stearns single, a stolen base and a Rusty Staub double, New York drew first blood, 1-0 after one. Jerry Royster walked and scored on Rafael Ramirez's doubled to tie it in the top of the second. Consecutive singles by Staub, Ellis Valentine and Hubie Brooks untied it the bottom of the third. 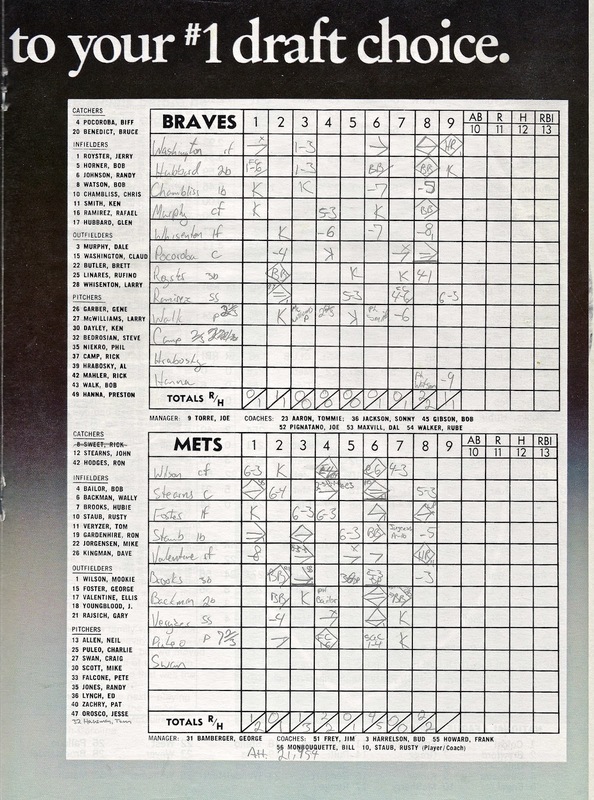 From there, the Mets were off the races, tallying twice in the fourth and four times in the sixth when Wally Backman doubled, Tom Veryzer singled him home, Mookie Wilson reached on an error, a Stearns double plated two, then George Foster singled him home. A good day for the Mets offense. Walk quickly yielded to Rick Camp, followed by Al Hrabosky and finally Preston Hannah. Puleo pitched into the eighth inning before coming undone. He surrendered a single to ex-Met Claudell Washington, walked Glenn Hubbard and, after recording an out, walked Dale Murphy. A Larry Whisenton sac fly followed by a Biff Pocoroba double plated two runs and drove the Mets starter from the game. Craig Swan, rehabbing from a rotator cuff injury, finished up. But by then in was New York 8, Atlanta 3. Valentine's two-run homer and a Washington solo shot made the final 10-4. Over and out. 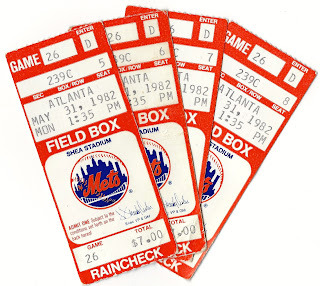 The Mets' record stood at 27-21, the Braves at 27-20. After their 13-0 start, Atlanta' had won just 14 games while losing 20. The Mets, who started May at 10-11, had since gone 17-10. Still, the arc of a baseball season is long and it bends towards talent, something Atlanta had in far greater abundance than New York. Led by 1982 NL Most Valuable Player Murphy and a supporting cast that included Bob Horner, Chris Chambliss and 43-year-old knuckleballer Phil Niekro, who went 17-4, the Braves won the West with an 89-73 record. The Mets finished a desultory 67-95, last in the East. Dave Kingman's 37 homers led the league, but his .204 batting average was the lowest ever for anyone who accomplished that feat. The Memorial Day game was a full-blown father, mother, sister, brother nuclear family outing after which my parents -- in keeping with the theme of the day -- drove from Queens into Manhattan for dinner at Staub's restaurant, Rusty's. Until we arrived, it hadn't occurred to me the ribs joint wasn't just popular with New Yorkers, but with the Mets themselves. The place was full of them. Pitchers Mike Scott, Tom Hausman, Jesse Orosco and Ed Lynch occupied a single table. I couldn't help but sneak glances in their direction, while a voice inside my head -- or maybe it was my mother -- reminded me that staring was impolite. Eventually, nature called and I made my way downstairs to the surprisingly small, single-occupancy men's room to take care of business. Once finished, I unlatched the door and found myself at eye level with the mid buttons of a silk shirt. I no longer recall if it was pink or gray, but it had an unmistakable sheen. Atop its buttons, above its collar was a familiar face, one I'd seen in that day's game program. It was the 6'-6" Lynch. I stood, startled, staring, transfixed. 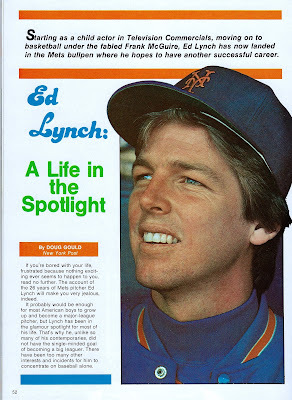 "You're Ed Lynch," I stammered. "That's right, I am." he replied. "I was at the game today! You guys were great! I'm such a big fan! I..." Frankly, I've no idea what I actually said. At some point I stopped. At least I hope I did. Then Lynch patiently asked, "Um... Can I get in there?" Spell broken, we traded places. He shut the door and I scrambled back up the stairs to breathlessly tell my family about the encounter. I consciously avoid even furtive glances at Lynch's table. Finally, the check came, the bill was settled and my mother, my sister and I waited outside for dad while he got the car. There we were, on the sidewalk, in front of the restaurant, in front of its big plate glass window, in full view of the pitchers. "They're pointing at you and talking," my big sister said, maybe just teasing me. I didn't dare look.